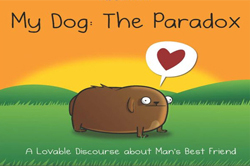 Matthew Inman dishes another helping of hilarity from his online comic The Oatmeal in My Dog: The Paradox. After years of carefully observing his own dog, Rambo, Inman follows his #1 New York Times best-selling How to Tell If Your Cat Is Plotting to Kill You, with this ode to the furry, four-footed, tail-wagging bundle of love and unbridled energy frequently dubbed man’s best friend. This eponymous comic became an instant hit when it went live on The Oatmeal.com and was liked on Facebook by 700,000 fans. Now fans will have a keepsake book of this comic to give and to keep. Brilliantly whimsical yet oddly informative, TheOatmeal.com is an entertainment Web site full of comics, quizzes, and stories. The site gets more than 5 million unique page views a month; 250,000 blogs and Web sites have linked to it. TheOatmeal.com is written, drawn, and coded by Matthew Inman, a king of all trades when it comes to the Web. Matthew lives in Seattle, Washington. He subsists on a steady diet of crickets and whiskey. He enjoys long walks on the beach, gravity, and breathing heavily through his mouth. His dislikes include scurvy, typhoons, and tapeworm medication. This entry was posted in Humor and tagged best web comics, comic, comics, comics online, dark humor comics, dog paradox, free online comics, funny cartoons, funny comics, humor, humor comics, humorous comics, jokes, Matthew Inman my dog the paradox, my dog the paradox, my dog the paradox the oatmeal, paradox dog, the oatmeal.